Gaming Discussion / Re: Favorite Obscure Genesis Games? General Chaos: Fun mix of action and strategy, especially with two players. Gaming Discussion / Re: Favorite really obscure SNES games? I'm not sure how obscure these are, but Metal Warriors, Zombie's Ate My Neighbors, and Ogre Battle come to mind. I also had fun with Congo's Capers. It's been years since I've played it though. ROM Hacking Discussion / Re: About the x.dmc file. I'll be very grateful if you know the answer!! It doesn't do anything special, just plays drum samples (ripped from CV2). I have a website, but it has not been updated in a long time. If you have the time, for sure. I have a generic map editor that I ended up using for this. I'll pm you later with some more details. I ended up removing the overhangs. I also remembered that the whistle/lake secret needs to be fixed. I chose this over Link's Awakening because: 1. nostalgia and 2. I like to play games on their original platform and I have a PowerPak. I like the automap. I have a couple of friends who won't play this or Metroid because they get lost too easily. I removed that column based system it had. Every screen is unique, and can have its own tileset. 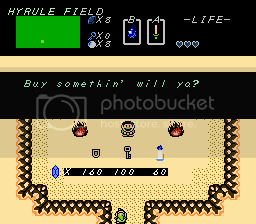 Each screen can also have its own unique shop/cave. Backgrounds can be animated. Most of the kinks to work out are in the dungeons. Things like fixing the trapdoors, removing the hardcoded outer walls, replacing the graphics with those from LA. I was also digging into the enemies, and hacking it so you can list each enemy that you want on a screen. I could send you the source. Either way, I'm still gonna work on this from time to time, so no worries. I took a look at it. The (E) version of the game moved some code by a few bytes. I can fix the editor to support both, but if you are in a hurry to get started get the (U) version. Stairs will only be climbable if you place markers on them. 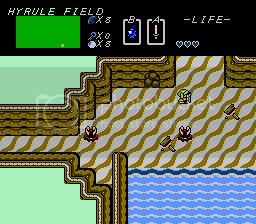 The game does not use tile or metatile numbers when deciding what can and cannot be climbed. Yes you are correct. Those are what you want to move around to fit your new design. Also, the editor cannot add new stairs. The most likely cause is a bad pointer (and poor error handling ). I'll take a look at the source later today and see if I can find the cause. By the way, the editor does not support the Japanese FDS version, if that's what you are trying to edit. The stair tool places markers on the maps where stairsets begin and end. You can drag and drop those around the map. Double click on the markers to change the direction. The pointer tool lets you choose which screens are mirrored across maps. When you are in "pointer edit mode" just click on the screen and an inputbox should appear where you can enter a new pointer. The editor will not validate this pointer other than to make sure it falls between $0000-$FFFF, so make sure you point to valid data. 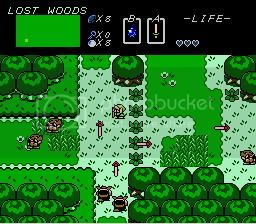 ROM Hacking Discussion / Re: Legend of Zelda... compressed graphics? The game uses chr-ram, so they aren't exactly aligned in rom. Offset them by a few bytes here or there and they should show up correctly. The data starting at 0x1C000 are DMC samples. The first one is used for the sword sound fx. I'm not sure where the samples end or what chunk of data is for what sound. Here's an incomplete dissassembly if it will be of any help.